The automated calcium analyzer has made the diagnosis easy. Similarly, the advent of Sestamibi scan has paved the way to minimally invasive parathyroidectomy indicated for parathyroid adenoma. There is no uniformity in the extent of minimally invasive parathyroidectomy that is done through limited incision under radio or sonar guidance and endoscopically. In this study, we are presenting the focused parathyroidectomy performed under sonar guidance and superficial cervical block (SCB). The prerequisite is concordant preoperative Sestamibi and ultrasound imaging. 99mTc-Sestamibi is highly sensitive (90.7%) and specific (98.8%) in the identification of parathyroid adenoma.1 99mTc-Sestamibi has revolutionised the approach to primary hyperparathyroidism. It is now possible to perform minimal access surgery of the parathyroid with very good results.3-5 Ever since, there has been a rise of minimally invasive parathyroidectomy (MIP) done via a small incision under radio, ultrasound guidance or endoscopically.6-11 The MIP is limited to primary hyperparathyroidism, more specifically to parathyroid adenoma. In sporadic parathyroid adenoma, Denham and Norman noted the incidence of single adenoma, four glands hyperplasia, multiple adenomas and cancer to be 87%, 9%, 3% and less than 1% respectively.1 Based on this finding, a large number of four gland explorations need to be performed to identify rare occurrence of multiple adenomas. Failing to localise any parathyroid in the presence of biochemical evidence of primary hyperparathyroidism may indicate hyperplasia in which case minimal access is contraindicated. The term "MIP" may be subjected to different interpretation, as we cannot ascertain what length of incision and extent of dissection represent MIP. We prefer the term "focused parathyroidectomy" to refer to the small incision (usually 2.5 cm) made directly over the adenoma under ultrasound guidance. No flap is raised as it is done for the four-gland exploration, but the strap muscles are split to gain direct access to the parathyroid adenoma. The adenoma is then identified and excised being constantly aware of the important relationship of the parathyroid with the recurrent laryngeal nerve (RLN) and the inferior thyroid artery. In view of the reported benefits of minimal access, we have routinely adopted the focused parathyroidectomy since 2013 where applicable, and we would like to reflect on the result thereof. To reflect on the result of sonar-guided focused parathyroidectomy under superficial cervical block (SCB) advocated for parathyroid adenoma. Retrospective review of parathyroidectomies performed between January 2013 and December 2014 at Chris Hani Baragwanath Academic Hospital (CHBAH). Data included demographics, localization studies (the ultrasound was performed by a single experienced sonographer), histopathology report, intraoperative findings, type of anesthesia, ICU admission, pre- and postoperative parathormone (PTH) and calcium (Ca+2) results. The endocrinologists worked up all patients and there was no case associated with multiple endocrine neoplasia (MEN). All cases done under general anesthesia (GA) or associated with concomitant thyroidectomy were excluded. Ethics approval was obtained from the Human Ethics Committee of the University of the Witwatersrand and the Research Review Board of CHBAH (M150274). Descriptive study. Continuous data are presented as mean or median and categorical data are presented as proportion by ratio or percentage. Patients were counseled for a superficial cervical block and supplementation with local anesthetic if need be. A sterile field was created and patient positioned supine with the neck facing the opposite side. A 22-gauge needle was inserted perpendicular to the skin in the middle of the posterior border of the sternocleidomastoid muscle (SCM). After feeling a "pop", 10 ml of 0.5% plain macaine was injected. Additional 4ml of macaine was used to fan caudally and cranially. Vitals (BP, HR, oxygen saturation) were monitored throughout the procedure. The patients were placed in a supine position with the neck slightly hyperextended. A soft pad, sponge or rolled towel was placed under the patient's shoulders to maintain the hyperextension of the neck and to lift the inferior pole of the thyroid out of the mediastinum.13 Patients were scanned preoperatively during the diagnosis work-up and again intraoperatively by a single dedicated sonographer. Patients were injected with 740MBq of 99mTc-Sestamibi. The images were acquired on a double head gamma camera equipped with CT (GE Hawkeye and Philips Bright view XCT). Dynamic images over the anterior neck were acquired for 3 minutes in a 128 x 128 matrix at 2 seconds per frame. Planar images of the neck and mediastinum were then acquired at 5, 20, 60 and 180 minutes post tracer injection. The anterior images were acquired for 3 minutes in a 128 x 128 matrix with a 20% window centered over the 140keV photo peak, using a LEHR collimator. SPECT/CT image acquisition was performed at 25 to 30 minutes, immediately after the 20 minutes planar image, with the field of view including the neck and mediastinum. A matrix of 64 x 64 was used for the SPECT data acquisition with 120 projections over a 360° arc, with 30 seconds per projection. A total of 20 patients had a parathyroidectomy between January 2013 and December 2014. Five patients were excluded because they had either a GA or associated thyroidectomy. The remaining 15 patients underwent focused parathyroidectomy under SCB. The mean age was 61.4 (45-85), majority of patients were female (13/15) with a female to male ratio of 6.5: 1. The median hospital stay was one day; one patient stayed for 6 days due to the underlying comorbidities. There was no high care admission. The majority of adenomas (86.6%, 13/15) were located on the inferior pole of the thyroid and there was equal distribution between left and right sides (7 vs. 8). The Sestamibi reported one intrathyroidal adenoma that was proven to be extrathyroidal on ultrasound and surgical exploration. Hypercalcaemia resolved in all patients. One patient developed persistent hypocalcaemia beyond three months. There was one temporary left recurrent laryngeal nerve palsy that resolved after 12 months and no mortality. There was no conversion to GA and no procedure-related complication associated with the use of SCB. The number of patients in American Society of Anesthesiology (ASA) classified as I, II and III was 2,10 and 3 respectively. There was a good correlation between localising studies (Sestamibi, ultrasound), intraoperative findings, histopathology report and postoperative blood result (calcium and PTH). One of the prerequisites for MIP is the availability of a quick PTH essay. This test is not available at our institution. However, the lack of this did not adversely affect our result. A possible explanation is the rarity of bilateral adenoma in sporadic primary hyperparathyroidism in our study group1 on one hand and the concordant preoperative localizing imaging that reduced the risk of error on the other hand. Ultrasound is an excellent non-invasive, inexpensive and readily available imaging modality that is helpful in the evaluation of parathyroid adenoma. The success depends on the use of a high-resolution machine and high frequency linear transducer. Ultrasound was used to substantiate the Sestamibi findings and, where concordant, to guide the minimal access surgery. The operator, the quality of ultrasound machine, and the abnormal site of the parathyroid determine the shortcoming of ultrasound. A tracheo-esophageal groove, mediastinal or retroesophageal parathyroid adenoma makes ultrasound localization poor if not impossible because of the acoustic shadow cast by the larynx, trachea and the sternum. Likewise an ectopic parathyroid will not be detected. The fact that a sonographer devoted to the parathyroid localization did all ultrasounds may explain the good correlation between the more objective Sestamibi and the more subjective ultrasound. With the routine use of sonar guided focused parathyroidectomy under SCB, high care observation postoperatively was no longer mandatory in our institution. The 99mTc-Sestamibi inaccurately reported one intrathyroidal adenoma despite the use of SPECT (single-photon emission computed tomography) that provides three-dimensional images for better localization of parathyroid adenoma. This happens when the parathyroid gland is very close to the thyroid and may even be attached to or covered by the thyroid capsule. Because of to the limited resolution of the gamma camera, these parathyroid glands may then falsely appear to be intrathyroidal on the 99mTc-Sestamibi images. SCB was well tolerated. Occasionally the surgeon had to add local anesthesia when patients experienced pain despite the block. Complications are rare and include injection into the dural sac creating an epidural or spinal block, injection into vertebral artery, phrenic nerve blockade, nerve injury, local anesthetic toxicity, haematoma and sepsis.25,26 SCB is advantageous especially for patients with multiple comorbidities that are considered high risk for general anesthesia. 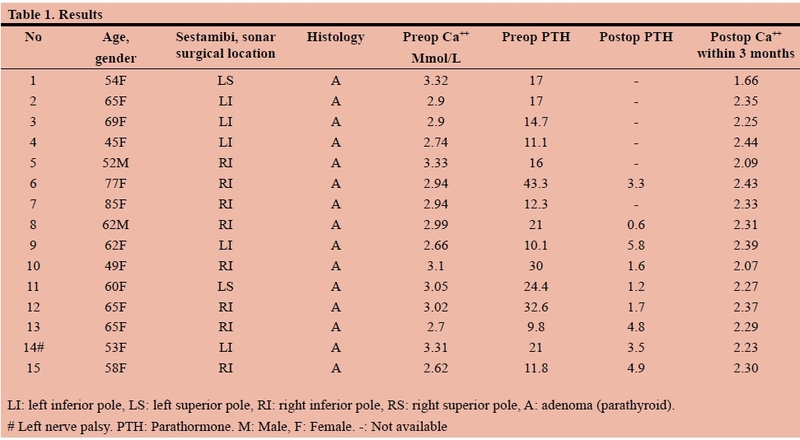 With concordant preoperative Sestamibi and ultrasound localization, sonar guided focused parathyroidectomy was feasible and achieved correct identification of the adenoma that was confirmed histologically and biochemically. SCB was successful in all cases and obviated the need for GA and high care.